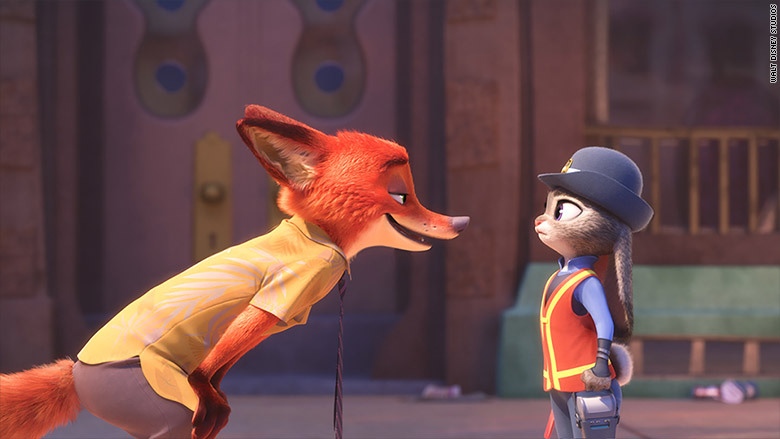 "Zootopia," Disney Animation Studios' new film, hopped to a big box office this weekend. "Zootopia" is the king of this weekend's box office jungle. The Disney (DIS) animated film brought in an estimated $73.7 million at the North American box office this weekend. This total makes the film the biggest opening in Disney Animation Studios history, skating by "Frozen," which brought in a $67.4 million opening weekend in 2013. The film starring Jason Bateman and Ginnifer Goodwin as a fox con artist and cop rabbit has so far made $232.5 million worldwide since opening in international markets three weeks ago. "Zootopia," which takes place in an animal metropolis, appeared to benefit at the box office thanks to a lack of family fare in theaters and nearly universal acclaim. The Disney feature currently holds a near perfect 98% score on review site RottenTomatoes.com and received an "A" CinemaScore from audiences. Over its 90-plus year history, Disney Animation Studios has created classics like "Fantasia," "The Jungle Book," "The Little Mermaid," and "The Lion King." "Zootopia" is the 55th animated film for the studio. Disney also owns Pixar Animation Studios, which has produced animated hits like "Monsters University," "Inside Out" and "Toy Story 3," which had a $110.3 million opening in 2010. "Zootopia" also took down 20th Century Fox's "Deadpool," which had been the #1 film at the box office the last three weeks.